Kernels is all about people. Particular people with a profound passion for perfectly popped popcorn. (Say that with a mouthful of Creamy Caramel!) Our Kernels people; who get up every day determined to create the world’s most extraordinary popcorn. Our customers. People who know a good thing when they taste it. Plain. Seasoned. Spicy. Sweet. Decadent or Low fat. Kernels has proven to popcorn lovers that even low fat can equal BIG taste! We pop it all. Air popped, or in sunflower oil, with absolutely no added trans fats. Fresh made, all day, every day in every Kernels store. In 1983 we vowed to change plain old popcorn forever. We did—with sensational tastes and flavours nobody imagined (nobody but us!) Our search for new and exciting flavours and products never stops. We’re celebrating a 29 year friendship with our customers. A mutual admiration society, “Krazy for Kernels” that has fostered our growth to almost 70 stores (that makes us the largest retail popcorn chain in the world!) Load up your shopping cart. Visit one of our stores. Say hi to our friendly staff. You’ll enjoy the Kernels experience. Check out our in-store value-added specials and fun promotions. Take home a signature blue bag bursting with flavour, a seasonal tin or a gift pail. Load up a Popcorn Plastic or Virtual Gift Card just for you: or as a gift for someone special. 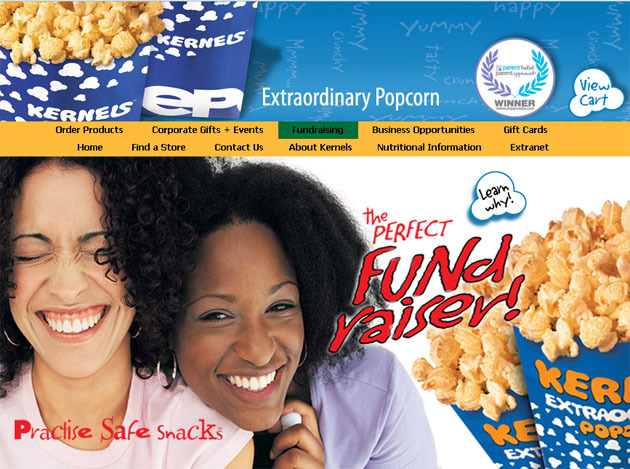 Kernels Extraordinary Popcorn is a joy to eat and a joy to receive. And, best of all, you’ll be joining those ever-increasing number of people who Practise Safe Snacks!